DetroitKnitter: Pumpkin Seeds, Pumpkin Puree and "Eating Pumpkin"
Pumpkin Seeds, Pumpkin Puree and "Eating Pumpkin"
Ahh, anyway this year I picked up 10 pumpkins over a couple trash weeks. I did trash one since it had developed a soft spot after sitting in my garage for two weeks. 3. Cut away seeds from both halves. Hold the stringy stuff and seeds in one hand and squish the seeds free landing them into a colander. Rinse the pulp from the seeds. Set aside. 4. 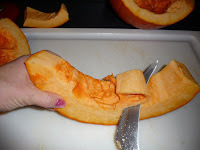 Slice the pumpkin into 2" to 2½" strips or as close as you can get. Obviously you will cut around the stem. 5. Using a knife "fillet" the mucky stringy stuff from the pumpkin strips revealing the firm flesh underneath. You do not have to remove the skin! Unless you really like using the knife and wasting a lot of time. 6. Next you'll cube the strips so they are sort of square. No they don't all have to be the same size. 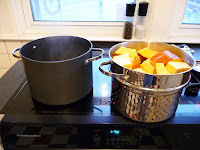 There are several different methods for cooking the pumpkin, but I've found the least troublesome and most consistent to be steaming. I have a very large pot with a basket that I use which will hold about 1/2 to 2/3 of a medium size pumpkin that's been cubed. 1. 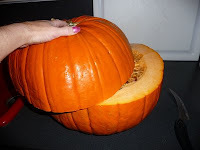 Toss the pumpkin cubes with the skin on into the basket and put the basket into a pot with a couple inches of water. 2. Turn the burner on high and bring the water to a rolling boil. 3. Once boiling turn the heat down to medium high and steam the pumpkin from this point for 30 minutes. If you still have white spots after 30 minutes steam it a little longer. 4. 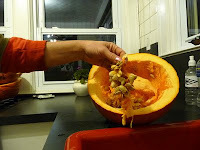 Dump the cooked pumpkin cubes into a strainer and allow to sit until long enough to handle without burning yourself. It takes a long time to cool so I recommend starting another batch or going on to working on your seeds in the meantime. 5. Once cool enough to handle you'll pretty much squish the skin away from the pulp with your fingers by sort of pinching the skin the pulp basically pops away. The skin is garbage. Put the pulp in a colander. 6. Mash the pulp while in the colander to release the extra liquid. Don't be gentle here... squish it good by pressing your hands down onto the puree so the liquid exits through the colander holes. You can use the bottom of a flat bowl or plate too! You don't have to squish it so it's dry, but you should be able to form a ball out of it that holds its shape. 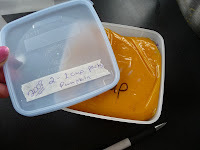 At this point you can fill freezer bags with pumpkin that I call "eating pumpkin". 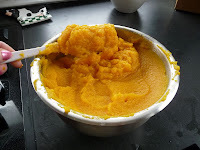 It's simply mashed up pumpkin that can be frozen for a whole year. 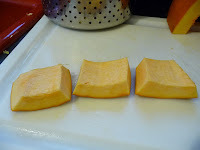 When you're ready to enjoy I nuke it a bit until I can get it out of the freezer bag, put in a a sauce pan and add a little bit of butter and cinnamon for a tasty squash side dish. Seriously! Even my husband likes it! 7. Continuing on with making the puree; after mashing and squishing you'll transfer it to a blender or food processor if you should be so lucky and puree it. Since you squished the liquid out this is not as easy as it seems and using a spatula to slide along the wall of the blender will help get it pureed. Yes, keep the spatula firmly against the side or you'll be picking silicone out of the puree! 8. 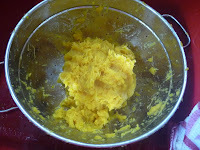 I then scoop 2 rounded cups of the final puree into freezer Tupperware. Actually I scoop it one heaping cup serving into a sandwich bag and load 2 packets into one Tupperware with a piece of wax paper between . 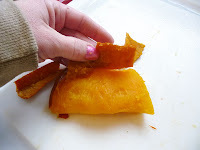 Of course you can use freezer bags too and use any portion size you'd like just be sure to remove the air before zipping closed and flatten the bag so when they freeze you have a stack of pumpkin "bricks". To thaw the puree I generally just let it sit in a bowl on the counter top. Discard any liquid that escapes which is why I use heaping cups because there's always liquid run off that reduces the amount of pumpkin that you end up post thawing. 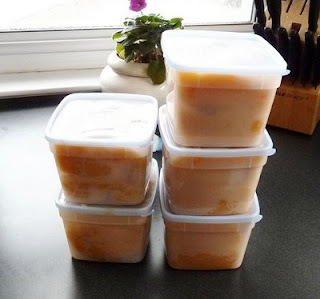 Substitute your pumpkin puree for the canned stuff called for in recipes! Another way to go about this is to not squish the liquid out, puree it, then let the liquid drip out through a jelly bag or several layers of cheese cloth. The squishing method is faster though. Each medium size pumpkin produces typically between 1½ to 2 cups of seeds so adjust the above ratio for how many cups of seeds you have. Bring the water, seeds and salt to a boil then turn down to simmer and cook for 10 minutes. Drain the seeds into a colander. I like to blot the seeds with a paper towel to remove as much water as I can. Heat the oven to 400 degrees. Spread about a tablespoon of olive oil over the bottom of a roasting pan. Spread the seeds out over the roasting pan, all in one layer. Bake on the top rack until the seeds begin to brown, 10-20 minutes. When browned to your satisfaction, remove from the oven and let the pan cool on a rack. Let the seeds cool all the way down before eating. Alternatively you can mix your seeds with the olive oil rather than coating the pan with it. You can use butter rather than olive oil. You can go way healthier and substitute either butter or oil with egg whites. Typically I use olive oil with sugar mixed in for "regular" seeds and also make "Cajun" seeds where I'll add some Cayenne pepper and sugar to the olive oil and mix them up before baking. There are a lot of different recipes, but IMO the first step should always be boiling the seeds in salt water.